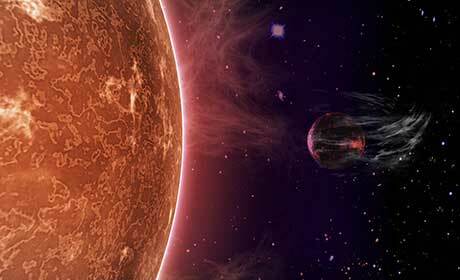 (Nanowerk News) Planets of the “super-Earth” category lose their atmosphere through too great proximity to their star. That is the result of an international research project coordinated by astronomer Dr. Mia Lundkvist, who is doing post-doc research at the Königstuhl observatory of Heidelberg University’s Centre for Astronomy (ZAH). After analysing measurements collected by “Kepler”, the NASA space telescope satellite, the scientists discovered that radiation from a star causes a loss of atmosphere: the atmosphere is blown into space and leaves behind a “stripped” planet core. Super-Earths are extrasolar planets that orbit around distant stars outside our solar system; they are among the most frequent planets in the Milky Way. The research findings were published in Nature Communications ("Hot super-Earths stripped by their host stars"). NASA’s 'Kepler' satellite permanently observes the same section of space and records changes in the brightness of the stars observed. Seen from the earth, small planets that pass in front of the star cause a mini-solar eclipse with tiny, characteristic changes in brightness. Kepler can pick these up. The artist’s impression shows how the atmosphere of a planet is “blown” into space by the intense radiation of its star. To come up with this research finding, the scientists first measured the size of the stars, their brightness and the distance of the planets to their respective stars. From that, they calculated the radiation intensity in the planet’s orbit. Dr. Lundkvist’s team evaluated data from “Kepler” in order to obtain the necessary exactness of measurements. The space observatory had originally detected the planet systems and then recorded the light of the stars for four years with great accuracy. With this data the astronomers were able to measure “stellar quakes”, i.e. tiny changes in brightness. That enabled them to calculate the structure, size and brightness of the respective stars. Mia Lundkvist says: “Using asteroseismology, our team was able to define the quantity of radiation falling on a planet with high levels of accuracy. That is a milestone towards better understanding the origin and development of planet systems.” The team were also able to show that no super-Earths orbit their star at very close proximity. “This has shown again that you can only characterize planets well if you also investigate the stars they belong to,” Saskia Hekker adds. She is a researcher at the Max Planck Institute for solar system research and was involved in the study. The Heidelberg research group of 29 astronomers. Many of them work at the astrophysical research centre at Aarhus University in Denmark. Next year NASA will launch a follow-up mission for the Kepler spacecraft. The experts assume that it will discover even more planets, including those whose atmosphere was also “blown away” by their sun.